It doesn't work for me at work and I use IE7. It doesn't work for me at home and I use FF 3.6. The announcement must have to be updated manually. I still miss the old method of subscribing to email notification on thegetting email notification on changes to the Maia EAP build announcements thread. This was brought up before, and the only thing I understood from Jetbrains is they only post announcement on twitter now. 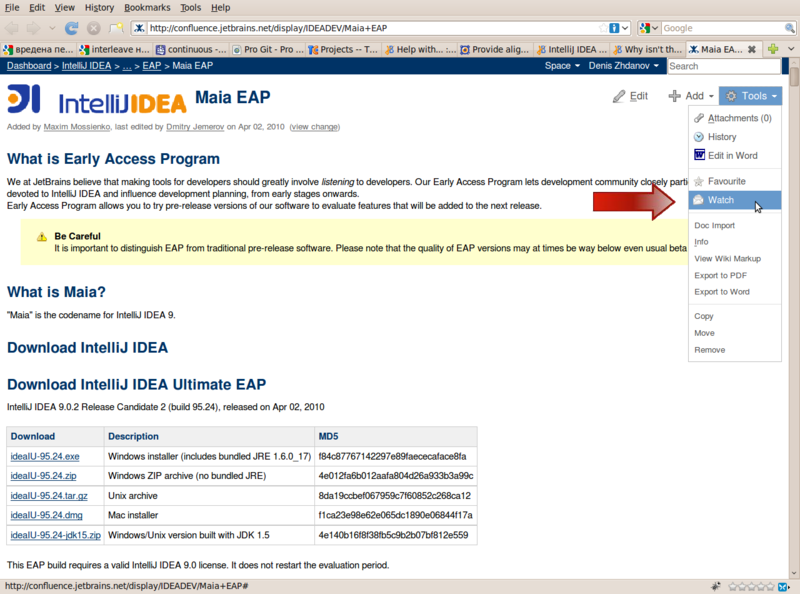 If anyone knows a way to still get email notification when new EAP is available, let me know. I still miss the old method of subscribing to email notification on thegetting email notification on changes to the /thread/281911 thread. This was brought up before, and the only thing I understood from Jetbrains is they only post announcement on twitter now. Hear hear. Let me know too please. jetbrains") which improved even more since this date. ... This was brought up before, and the only thing I understood from Jetbrains is they only post announcement on twitter now. Pretty useless for those of us who don't use Twitter... what's wrong with posting on their own forums? I only see Attachments, History, Info, and View Wiki Markup. Are you logged in to JetBrains Confluence or just browsing the pages anonimously?